Individual and highly polished quartet who, with authentic three-part vocal harmonies, recreate the sounds of the 1920s, 30s and 40s, with an element of serious visual tongue-in-cheek humour. 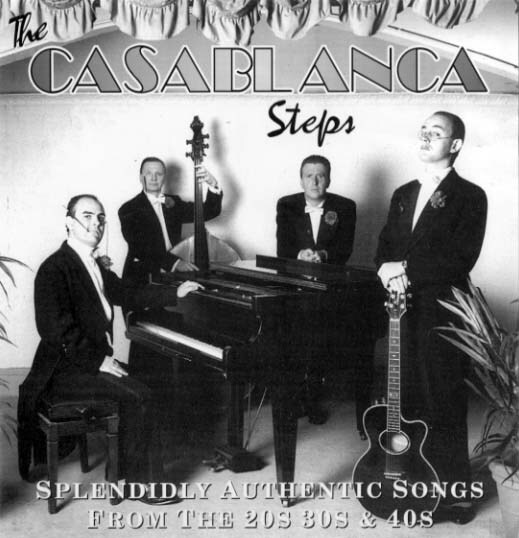 Yes, 'Let's Face The Music And Dance' to the sounds of...The Casablanca Steps, who will transport you to a time when the 'Charleston' was all the rage and the swells were 'Putting On The Ritz'. Individual and highly polished quartet who, with authentic three-part vocal harmonies, recreate the sounds of the 1920s, 30s and 40s, with an element of serious visual tongue-in-cheek humour. Yes, ‘Let’s Face The Music And Dance’ to the sounds of…The Casablanca Steps, who will transport you to a time when the ‘Charleston’ was all the rage and the swells were ‘Putting On The Ritz’. – Promotions for Mercedes, BMW, Marks & Spencer, Browns etc. Create an evening of sophistication and fun and bring back to life a time of splendour, intrigue and romance.